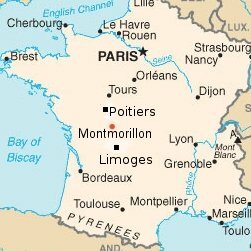 The house is about an hour’s drive from both Poitiers and Limoges, and 5-7 hours drive from the Channel ports. So you can go by ferry to Caen (the shortest drive to the house), drive through the tunnel or take advantage of cheap flights from Stansted, Liverpool, Gatwick, Southampton and Edinburgh. Find some useful links on this page …. There are plenty of cheap flights from Stansted or Liverpool to Poitiers or Limoges by Ryanair or from Southampton to Limoges by FlyBe. British Airways also fly from Gatwick to Limoges during the summer season. The house is about 5-6 hours from Caen or Dieppe; 6-7 hours drive from Calais. Ferries go from Dover, Newhaven, Portsmouth and Plymouth. Try Transmanche Ferries, Brittany Ferries or many others from Dover. We’ve found EuroTunnel to be really good, especially if you get sea sick! It can be much cheaper than ferries as well, but it’s a longer drive to the house than from Dieppe. Or get the train all the way. From UK you can take Eurostar and TGV which takes 6 hours from London to Poitiers. Or stop off in Paris which is only 2.5 hours to Poitiers.